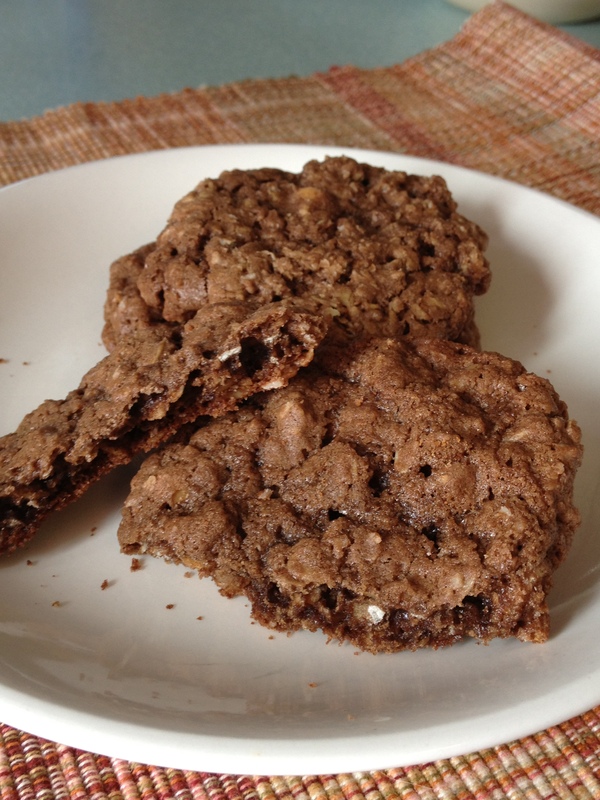 Storm Prep: Chocolate Oatmeal Cookies! We were getting ready for another big storm to hit KC. Like most people, I’m sick of the snow but what are you gonna do, right? Well, with nasty weather coming in, I did what most normal women would do to get ready. First, I got a pedi. Everything’s better with fresh nails, right? And then, I baked cookies! With fresh nails, warm cookies, books on my Kindle and plenty of movies, I don’t mind being snowed in! We “lucked out” and this last round wasn’t as bad as it might have been. Still, I’m home waiting for the snowplow. We live on a cul-de-sac and are the last ones to be plowed out. It’s usually a combination of a bobcat and a snowplow. So far I haven’t seen either, but that’s OK with me. I’ve got cookies! This recipe is simple and tasty. It doesn’t use any weird ingredients, so if you’re snowed in you might have everything in your pantry to make these now. I used peanut butter chips and no nuts, but you could use any combo of chips and nuts you like. In the bowl of an electric mixer fitted with the paddle attachment (or using a hand mixer), cream together the butter and sugars until soft and mixed. Add in the eggs one at a time, scraping down the sides of the bowl as needed. Add in the vanilla, baking soda, and salt, and mix on low until combined. Mix the cocoa powder and flour together and add gradually with mixer at low speed. Once combined, add in the oats and mix. Stir in the nuts and chips and mix until just incorporated. Form the dough into one-inch balls or use a cookie scoop and place on a lightly greased cookie sheet about 1-2 inches apart. Bake for 11-12 minutes until set, but don’t overbake. Let them cool for one minute on the sheet and then remove to a cooling rack.